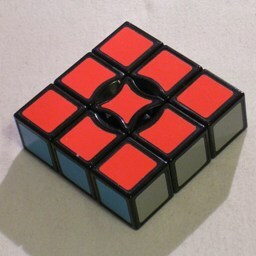 This puzzle is generally known as the Super Floppy, as it is a Floppy Cube which also allows quarter turns. This allows the corner pieces to move to locations above and below the edge pieces, changing the shape of the puzzle. It was also invented by Katsuhiko Okamoto. There are two versions of the puzzle. The official version has an internal mechanism that blocks you from twisting a side consisting of only an edge piece without any corners. The imitation version lacks that mechanism, and by allowing you to twist an edge piece in isolation makes this easy puzzle much easier. There are 4 corners which can be in any of 12 locations. The edge pieces don't travel, but do have 4 orientations each. This gives a total of 12·11·10·9·44 = 3,041,280 positions. All of these are attainable. Suppose we consider only the shape of the puzzle, ignore the colours. Then there are 12-choose-4 = 12!/(8!4!) 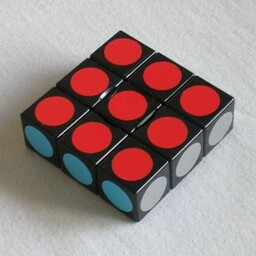 = 495 ways the corners can be arranged if the puzzle has a fixed orientation. The puzzle as a whole has 8 orientations, so there are about 495/8 possible shapes. Some shapes have symmetry, so to calculate the exact number we need to apply Burnside's Lemma. This gives 72 distinct shapes. Only 18 shapes are mirror symmetric and the rest form 27 mirror image shape pairs. The eight QTM antipodes are positions with solved corners, three edges that need a half turn, and one that needs a quarter turn. Gentosha Toys is the manufacturer of this puzzle. Phase 1: Solve the shape, i.e. make it flat. Do any moves necessary to bring together an empty corner location and a corner piece that is sticking out. Hold the puzzle so that the front right corner location is empty, and the front edge has a corner piece sticking out above or below it. If the front left corner location is empty, then you can just turn the front to bring the corner that is sticking out into the main layer. If on the other hand the front left corner location is full, then turn the left side to make that corner location empty. Turn the front to insert the corner at the front right location. Finally turn the left side back to where it was. Repeat steps a-c until no more corners are sticking out. The tree diagram below shows all possible shapes, and you can use it to solve the shapes optimally. The shapes coloured yellow are symmetric, the others occur in mirror image pairs, one on each side. Phase 2: Solve the pieces. Solve the corners. Note that colour on the outside of an edge piece does not change when that side is rotated. Therefore the outside colour of the four edges can be used as reference points for placing the corner pieces. It is very easy to put one corner in place, then one of the adjacent corners without moving the first, and finally swapping the last two by a single move if necessary. On the imitation super floppy there is a much easier way, namely to do R L so that the front edge piece is free, rotate the front edge piece to solve it, and then R' L' to restore the sides. Repeat step b until all the edges are solved.